After the religious rituals ended on Nikini Poya day (on Wednesday August 17), President Maithripala Sirisena, who was at his Paget Road residence found time to read the day’s newspapers. His attention was drawn to a report of a news conference the ‘Joint Opposition’ leaders had given on the Office for Missing Persons law. They were voicing their protests over the Government “rushing through” the Bill in Parliament without hearing their views or the amendments they wanted to move. Sirisena telephoned one of the participants, Kandy District parliamentarian Keheliya Rambukwella. A onetime Media Minister, Rambukwella is a strong supporter of the Mahinda Rajapaksa faction of the Sri Lanka Freedom Party (SLFP). “I spoke at the news conference about the dangerous consequences from the Office for Missing Persons. I said we strongly believe it is in conflict with the Constitution,” Rambukwella told the Sunday Times. “The next day President Sirisena telephoned me”, he said. He told me that he had read my remarks in the newspapers. The President wanted to have an “independent opinion” about the new Act. I told him that I would consult other members of the ‘Joint Opposition’ and formulate one. Thereafter, he had proposed to discuss the matter with different groups including those from the ‘Joint Opposition’. Rambukwella said they had hoped to send their views by tomorrow and nominate a representative for discussions with Sirisena thereafter. However, before that task was carried out, Rambukwella was a casualty on that very Poya Day at the hands of Sirisena. He was among 16 Sri Lanka Freedom Party electoral organisers and 24 District Organisers who have been removed from their posts. Yet, they still remain members of the party. That came as a major diversion and spurned pro-Rajapaksa loyalists to react. They were no more in a mood for a “temporary rapprochement” to discuss the Office for Missing Persons Act which now awaits certification by Speaker Karu Jayasuriya to become law. 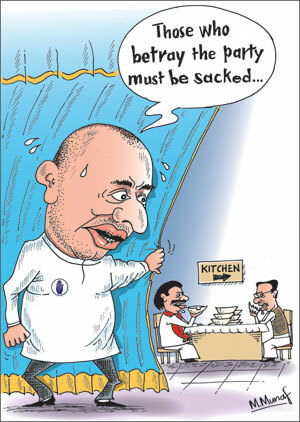 Jayasuriya has rejected moves to ask him to desist from signing the bill into law. There was a more important issue to tackle for the pro-Mahinda Rajapaksa faction. With the stroke of a signature, SLFP General Secretary Duminda Dissanayake, a relative new comer to politics, appears to have hammered the first splitting axe blow that signals the division of the SLFP. He sent out the letters removing the electoral and district organisers after reaching consensus with party leader Sirisena and colleagues. Among the many casualties were former ministers who were organisers – Gamini Lokuge (Colombo District), Rohitha Abeygunawardena (Kalutara District), C.B. Ratnayake (Nuwara Eliya District), Mahinda Yapa Abeywardena (Matara District) and Pavithra Wanniarachchi (Ratnapura District). The decision not to take disciplinary action against some former ministers who were supporting Rajapaksa sparked speculation that they saved their positions only because they continued a dialogue with a faction supporting Sirisena. To the contrary, it appears that only one person from each district has been picked for disciplinary action and the exercise is intended to be a warning to others. “That is not the end of the matter,” a Sirisena loyalist said. The Mahinda Rajapaksa faction has already gone into overdrive. His loyalists including professionals met at their office at Nelum Pokuna Road in Battaramulla on Wednesday night. It was chaired by Basil Rajapaksa. Another meeting at the Mirihana residence of Mahinda Rajapaksa followed the next day, Thursday. Rajapaksa named a committee to study the expulsion and report back immediately. Members of the committee were Basil Rajapaksa, Dullas Allahapperuma, Pavithra Wanniarachchi, Rohitha Abeygunawardena, G.L. Peiris and Mahinda Yapa Abeywardena. They reported back to Rajapaksa the same day. Their major recommendation was to immediately form a new political movement. Significantly, it was not a new political party, at least for the time being. That appears to have taken the sting off President Sirisena’s strongly-worded warning at the national unity government’s first anniversary rally in Matara on Friday. He vowed he would reveal more secrets of pro-Rajapaksa rebels if they went ahead and formed a new party. In a statement, from the Presidential Secretariat, Sirisena declared that he would not let those who are crowned with fraud, corruption, waste and robbery to rule this country again. Those remarks appeared to underscore the fact that Sirisena was quite concerned about the emergence of a new political party, one that would formally divide the SLFP. He fired this new salvo in the hope that they would desist from moves towards forming a political party. The move to form a political movement was agreed upon after speakers claimed there were “a lot of political issues” next year. One was the local council elections in January next year. These would be followed by elections to Provincial Councils, the terms of which would end at different times. Once a new Constitution is formulated, there would be a referendum. All these could be faced with the formation of a new political front to seek the support of the public. One of the ‘Joint Opposition’ frontliners, Matara District MP Dullas Allahapperuma, in keeping with a decision reached, resigned his position as the District’s SLFP organiser on Friday. The others who still hold office as district or electoral organisers are to follow suit one by one. The next is expected to be Kalutara District SLFP organiser Kumara Welgama, the former Transport Minister and Rajapaksa backer. The idea appears to be to provoke the SLFP leadership into sacking them from the party and thus oust them from their parliament seats. In the event of such sackings, one of them said they would go to courts, which they believed would uphold their right to remain. They said they were holding on to this belief because in similar situations, other MPs had found justice in the courts. Such sacking, another said, would give them the opportunity of staking a claim collectively for the office of the Leader of the Opposition currently held by Tamil National Alliance (TNA) leader Rajavarothayam Sampanthan. In the light of upcoming local authority polls, some said Sirisena was trying to rid the party of pro-Rajapaksa groups – a measure that would arguably give him full control of the party, even if it be a fractured one. Earlier, Rajapaksa said in a statement that “popular organisers of the SLFP are being removed and replaced with less popular politicians in order to weaken the SLFP and to give advantages to the UNP.” He charged that the “responsibility for splitting the SLFP by removing its most popular electoral organisers will finally have to be borne by the President who is the leader of the party.” Those dismissed and other Rajapaksa loyalists will boycott the SLFP annual sessions in Kurunegala on September 4 and 5. Yet, the ongoing arrangements for the events show there is likely to be a large turnout. Rajapaksa is now planning to visit Italy where there are a considerable number of Sri Lankans. He made trips earlier to Thailand and South Korea. ‘Joint Opposition’ leader Dinesh Gunawardena told the Sunday Times; “We are planning a series of seminars at the grassroots level to educate the people on the removal of organisers. Government leaders are panicking. That is why they are threatening us,” he said. The current imbroglio in the SLFP has shades of a similar situation that arose when the late Sirimavo Bandaranaike was stripped of her civic rights in October 1980. A faction led by her number two Maithripala Senanayeke urged that she give up the leadership. Senanayeke and 13 senior members including Anura Bandaranaike, P.B.G. Kalugalle, and Stanley Tillekeratne were suspended. A purported Central Committee meeting they held was dubbed the takaran CC or meaning one held under a tin roof. The party headquarters at Darley Road in Colombo Central became a bone of contention and the late Anura Bandaranaike went to Court. They were commonly referred to as the SLFP (M) group. The Senanayake-Bandaranaike group then had the tacit support of then United National Party (UNP) Government led by President J.R. Jayewardene. The 1982 Presidential election were held with the SLFP split and Jayewardene romped home the easy winner. The two factions patched up their differences in 1983. However, a section of the pro-Sirimavo Bandaranaike group left the party to form the Sri Lanka Mahajana Pakshaya (SLMP). In 1991, Ms Bandaranaike, in a bid to consolidate more power in the SLFP, changed the composition of the Central Committee. She named new faces that included S.B. Dissanayake, Mangala Samaraweera, Nimal Siripala de Silva Late Alavi Mowlana and Wishwa Warnapala. Thereafter, she enrolled Chandrika Bandaranaike Kumaratunga into the SLFP fold – a move that drew some criticism. One of those who publicly opposed the move was Tilak Karunaratne. He was sacked. Anura Bandaranaike who criticised the suspension in an interview to a newspaper was indefinitely suspended without reason or inquiry. That paved the way for him to join the UNP in December 1993. Even if Sirisena’s diplomacy to reach out to Rambukwella did not materialise, the Poya day telephone call underscored another significant aspect – that he entertains doubts about the Office for Missing Persons Bill passed rather controversially in Parliament. Hence, he was making attempts to inform himself of any flaws. That is after the Government side has passed it in Parliament on August 11, ten days ago. In fact a blunder by those in the ‘Joint Opposition’ was to lead to a situation that was seized by the Government. At first, ‘Joint Opposition’ leader Dinesh Gunawardena had sought a debate in Parliament lasting one and half days with voting to take place on August 12. There was a tussle with the Opposition arguing that the debate should continue till late Friday night. Prime Minister Ranil Wickremesinghe was to explain that he had the LAWASIA conference and related events to attend. That saw Speaker Jayasuriya urging Foreign Minister Mangala Samaraweera to begin his speech. A group of ‘Joint Opposition’ MPs rushed into the Well of the House and there was a commotion. In view of the commotion, Samaraweera made his speech short. He was followed by two other MPs. The Speaker directed the Opposition MPs to return to their seats but the confusion continued. Thereafter, the Speaker announced that the Bill has been read a third time and passed. The House was then adjourned till the following day. What was to have been a nearly 13 hour of debate eventually ended in an hour. Both Foreign Minister Samaraweera and ‘Joint Opposition’ representatives held separate news conferences soon after Parliament adjourned. The ‘Joint Opposition’ claimed that the Bill was illegally enacted, that it had not been passed following the correct parliamentary procedure in passing bills. However, Samaraweera asserted that the Bill had been approved by the majority in the House and would become law soon. Speaker Jayasuriya is to give his assent next week. The crisis within the SLFP places the United National Party, particularly Prime Minister Ranil Wickremesinghe, in a strong position. After his return from China on Wednesday night, one of the priority tasks for him will be to formulate a revenue generating system because of the Value Added Tax bill that sought to impose a 15 percent tax has been put on hold. The SLFP is formulating its own revenue proposals and the task has fallen on Minister Susil Premajayantha. Thereafter, formal talks between the UNP and the SLFP are to follow on the best approach to VAT. The subjet was intensely discussed at Tuesday’s ministerial meeting. In this backdrop, Megapolis and Western Development Minister Patali Champika Ranawaka, who is the Jathika Hela Urumaya (JHU) representative in the Cabinet of Ministers has placed his own proposals. It has come in the form of a Cabinet Memorandum, a copy of which has been seen by the Sunday Times. Ranawaka has cautioned that tax income from the Government is fast decreasing compared to the Gross National Product from 14.6 per cent in 2006 to 10.1 per cent in 2014. He has also noted that income tax revenue is also gradually decreasing compared to the Gross National Product from 2.7 per cent in 2006 to 1.9 per cent in 2014. Since the existing Government is a national Government, discussions should be started to create a consolidated national policy for the 04 years between 2017-2020 on income, tax policy, expenditure and investments of the Government. With a view to realise that goal, an extended round of discussions has to be conducted with all the sectors and stake holders with the leadership of both the President and the Prime Minister. I do herewith request to publicise the intellectual committee report prepared few years back pertaining to the possible actions to be taken on VAT recovery and avoiding VAT frauds. At this, income tax, capital tax etc, should be formally revised to achieve at least 5% goal of gross national product in order to increase the direct tax amounts. The private health services, private educational services, legal services and other services that have informal financial circulation should be converted to a formal commercial process. Percentage of indirect taxes should be increased up to 10% in gross national production by identifying bearable limitations, identifying the goods and services that should be discouraged, and formally identifying the sectors that should be developed. An excise tax policy should be followed for liquor, cigarettes, fuel that is not influencing public transport etc,. (Percentage of our tax income from excise tax is 25%). The informal commercial process should be formalised by reaching the threshold of Rs. 100 million (from proposed Rs. 12 million) a year including others in the VAT network and goods and services marketing income excluding only essential goods and services from the items more than 500 in number by keeping the VAT limit at 15%. Limiting the occasions of invoicing, increasing and deducting prices unreasonably in export and imports, import and custom tax charges should be formalized. (At present, tax on imports is 9% while tax on customs is 19% from the total tax. An amount of US$ 17,302 million has been lost to the country due to changing import-export invoice value during the past 10 years). A tax policy should be introduced highlighting the innovations, green technology, and small and medium scale enterprises. It is not only formulating a new revenue generating formula that is President Sirisena’s priority. He also has a full agenda on the foreign policy front. He will leave for New York to attend the 71st sessions of the United Nations General Assembly (UNGA). Among those accompanying him are two Ministers – Gayantha Karunatilleke (UNP) and Faiszer Musthapha (SLFP). Others in the official entourage include Deputy Minister Ajith Perera, Nalaka Colonne and Wijepala Hettiaratchchi. Earlier plans for Sirisena to lead a delegation for the 17th Non-Aligned Summit in Caracas, Venezuela have been shelved. Instead, Sri Lanka is likely to be represented by Minister Mahinda Samarasinghe. From Caracas, Samarasinghe will fly to New York to join the Sri Lanka delegation at the UN. Sri Lanka’s Ambassador in Cuba who is accredited to Venezuela will also travel to Caracas. A Foreign Ministry source said “even Indian Prime Minister Narendra Modi” is not taking part in the Non-Aligned event this year. President Sirisena is listed to speak at the UNGA on the second day of the sessions. Earlier, there were plans for Sirisena to fly to China for a peace conference in Beijing and later to New York. However, the event, a Foreign Ministry source said yesterday, clashed with the date allotted for his speech. Sirisena will now leave for New York on September 19 and return to Colombo on September 24. The upcoming UNGA sessions are being described as a landmark event. It will be the last assembly sessions Secretary General Ban Ki-moon will attend. Ban is due to visit Sri Lanka on September 1 on a farewell call and will leave on September 3. Diplomatic sources say he will discuss with Government leaders, among other matters, the UN Human Rights Council (Geneva) resolution on alleged war crimes, a resolution jointly sponsored by the United States and Sri Lanka. The focus, these sources said, would be on the enforcement of provisions in the resolution, particularly regarding the probe into alleged war crimes. This will also be the last UNGA session US President Barrack Obama will attend. Sirisena has also been invited to take part in the 19th Clinton Global Initiative (CGI). This annual event is the initiative of one time US President Bill Clinton. His wife Hillary, who is the front runner in this year’s US presidential election, is also expected to participate. The Government’s calendar in the coming weeks highlights priorities in a number of areas, most importantly, the economy. With the UNF Government’s second budget fast approaching, its fiscal strategies would have to be worked out. That makes the issue of the increased VAT the focal point. On the political front, a political movement now planned by Rajapaksa loyalists would target the same issue as they try to win the confidence of the people, especially the SLFP supporters in the country. Issues related to the alleged war crimes inquiry, said to begin next year, will add to the weight the Government is saddled with.